China has initiated a rail-freight service to Britain as part of President Xi Jinping’s efforts to strengthen trade ties with Europe. The first train departed Yiwu in eastern Zhejiang province on January 1st and will cover more than 12,000 kilometers (7,500 miles) in about 18 days before reaching London, China Railway Corp. said in a statement Monday. The service, carrying garments, bags and suitcases among other items, will pass through Kazakhstan, Russia, Belarus, Poland, Germany, Belgium and France. London becomes the 15th European city with direct trains from China following the unveiling of Xi’s so-called Belt-and-Road initiative in 2013. The plan put transport links at the center of efforts to create a modern Silk Road and boost commercial ties to markets across Asia, Africa, the Middle East and Europe. While the train can carry about 200 containers, versus 20,000 on a large cargo vessel, the trip takes about half as long as a 30-day sailing between East Asia and northern Europe. That will make rail a competitive option when maritime shipments are held up or miss the booked departure, especially compared with airfreight, which costs twice as much, according to Michael White, operations director at Brunel Shipping, the U.K. booking agent for the service. 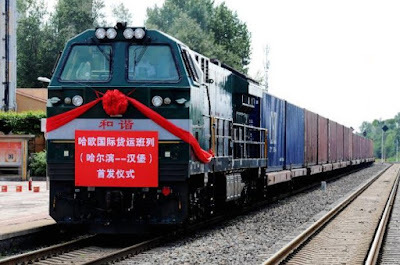 Brunel is also involved in the operation of a China-Madrid freight train that’s run for more than a year and ranks as the world’s longest rail service, ahead even of the Moscow-Vladivostok trans-Siberian passenger route. The Spanish train carries olive oil back to China, and White said in an interview that the U.K. operation, which will unload in Barking, east London, needs to tap a similar export flow, possibly of British designer goods. China has initially set aside about $40 billion in a fund to finance roads and railways abroad under President Xi’s strategy, while trade with countries along the corridor could reach $2.5 trillion in about a decade. Railways are one of the top priorities of Xi and only last month, the country announced that it plans to spend 3.5 trillion yuan ($503 billion) to expand the national system by 2020. A high-speed rail network will span more than 30,000 kilometers under the plan, according to a State Council Information Office briefing in Beijing Thursday. The distance, about 6.5 times the length of a road trip between New York and Los Angeles, will cover 80 percent of major cities in China. China has also used railways as a diplomatic tool overseas. Chinese domestic train manufacturers have targeted emerging markets in Africa, Latin America and Southeast Asia for rail-related orders while also bidding for high-profile contracts in the developed world. China’s economy is on pace to meet the official growth target, posting 6.7 percent expansions in the first three quarters of 2016.